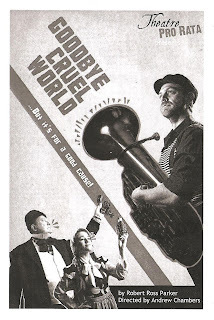 Theatre Pro Rata's Goodbye Cruel World closes today so if you haven't seen it already, I'm afraid you're out of luck. (Sorry about that, blame NYC.) But for the record, it's a fun and wacky ride ably driven by six actors playing multiple characters, often in the same scene. A modern adaptation of Russian playwright Nikolai Erdman's The Suicide, which was banned by the government and not produced until after his death, it's a farcical look at a man down on his luck who offhandedly wonders if he would be better off dead, only to be taken seriously by his wife, neighbors, and eventually the whole town. Everyone from the church to the intelligentsia, a post man to an artist, wants Semyon to promote their cause in his suicide note. His neighbor decides to turn it into a lottery, but in the end Semyon realizes he doesn't want to die, much to everyone's disappointment. Read on for some highlights of the show. 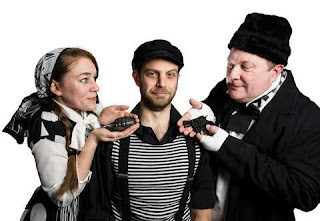 Much of the fun comes from watching the six actors (Ben Tallen, Derek Meyer, Edwin Strout, Elizabeth Efteland, James Ramlet, and Katie Kaufman) transform into dozens of characters just by donning a hat or a mustache or an even sillier accent. There are lots of quick exits and entrances, or even changes behind a set piece on stage (the funeral scene is a particular delight), that make it seem like there must be more than just six actors. But nope it's just the six, performing with great energy and physicality. The character changes are aided by Mandi Johnson's colorful and vaguely Russian patchwork costumes, featuring a fun mix of stripes, polka dots, and patterns. The stage space at the new Crane Theater is large, and scenic designer Brian Hesser has made great use of it, creating a set with depth and height and many doors for characters to rush into and out of. There's a bit of singing too, which is fun (because it would be a shame not to hear James Ramlet's booming voice). At about 100 minutes with no intermission, the show is just the right amount of fun and hijinks, and is over before the premise wears thin. Theatre Pro Rata concludes their 2016-2017 season with their annual show in partnership with Park Square Theatre this spring - Up: The Man in the Flying Chair.